Recently we were called by a client to remove and reinstall her window treatments that we had done a few years back as she was having her windows replaced. During our initial appointment she mentioned that the window "expert" told her: "Once you replace these windows, you won't need these drapes".... Say What!!! Okay, okay I am thinking maybe he just doesn't like custom draperies. Whatever his preference in window coverings, it certainly has ignited a spark to this blog: The Last Step To An Energy Efficient Home. Sure, you've replaced the windows, given up the water heater blanket for a tankless system, set the thermometer to 68 degrees, swapped out the light bulbs while reminding the kids for the umpteenth time to turn off that light! and, you've even considered radiant heat flooring, but what's the common denominator to The Energy Efficient Home? We do love this quote: "No rules, no right or wrong, just what you think is beautiful" and if you're at this stage in the renovation, certainly the window coverings must be considered for keeping the heat in or keeping the heat out of our Energy Efficient Home, which brings us to Rule Number One - Layering. The "foundation", simply put, is the shade, the blind, the shutter, the practical application that allows light, light filtering, light blocking, privacy, color, style and presents so many possibilities for our Energy Efficient Home by insulating the window. How do you know the window covering is insulating? ASK FOR THE R-VALUE, which leads us to our next question. Ahhhh, we are assured, by this chart, that the layers at the window do increase our energy efficiency. Okay, we proved our point (insert wink) and we're moving on with our energy-efficient window covering foundations, yes, foundations, the starting point to great design. 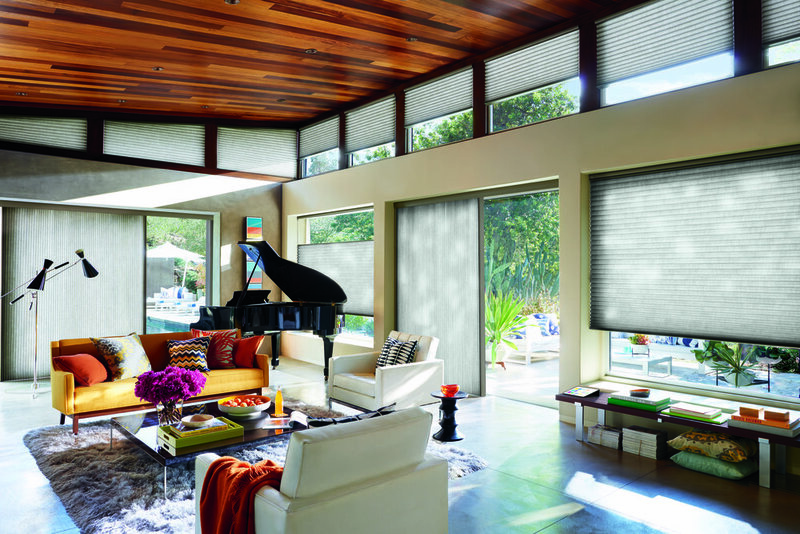 Duette Honeycomb Shades versatility is unsurpassed with specialty shapes: The Vertiglide for sliding patio doors, operational angles and motorization. One shade for all windows. Talk about R-Values! It's been said that Shutters are like putting a door on the window. Woven Wood Shades as insulators? Yes! With quality linings woven wood shades bring an unexpected element of texture and beauty to our energy-efficient window coverings. The Drapery! Nothing finishes the window like a custom drapery. From the pleat style to the luxurious folds of the fabric, it's the lining that creates the energy-efficient drape. Consider quality thermal or black-out linings and be sure to select a color for those street facing windows that coordinates with your home's exterior. An uncovered window wants to be covered. Will any combination do? Drapery photo with decorative pillows from our friends at Stout Textiles with a few suggestions for our foundation covering. This much I know is true, We Love Drapes! With a fully-lined custom drapery you expand the options of your foundation window covering, (aka: common denominator #2), as the drapery becomes the major insulator - sheery, open weave fabrics become an option. Think back to when sheer drapery panels were combined with a full drapery all set-up on a double traversing rod. A practical solution for its time that gave you the fully exposed view through the window when both drapery pairs were drawn, filtered light when the sheers were closed and so on. With today's technical advances in window coverings, one shade will do it all and the drapery? The drapery is the finishing touch that completes the room, and there we have it "The Last Step To An Energy Efficient Home". Your Fashion is Our Passion, especially when it comes to window coverings and the energy-efficiency they provide. All of the products we've featured can be seen in our Showroom and we're just a phone call away - at (805) 237-1400 - to bringing the Showroom to you. Check out our Promotions Page to download a coupon for additional savings. Thank you so much for following along with us! To see more of our Blogging efforts on everything from the floors on up, there's a 'subscription button' at the bottom of this page. Tagged: Energy Efficient Drapery, Custom Drapery, Do you Duette?